Secretary of State Mike Pompeo arrived in Turkey on Wednesday after visiting Saudi Arabia in response to the disappearance of the Saudi critic Jamal Khashoggi. Pompeo and President Donald Trump have put a lot of stock in the Saudis to investigate themselves over Khashoggi’s suspected murder and appear to be on the same page. But Turkish officials continue to leak gruesome details alleging a murder on a daily basis. Turkish President Recep Tayyip Erdogan has cracked down on the press to gain nearly complete control of Turkish media. US senators and UN human-rights officials aren’t buying Saudi Arabia’s story on Khashoggi, and Turkey continues to blow apart Trump and Saudi Arabia’s understanding. 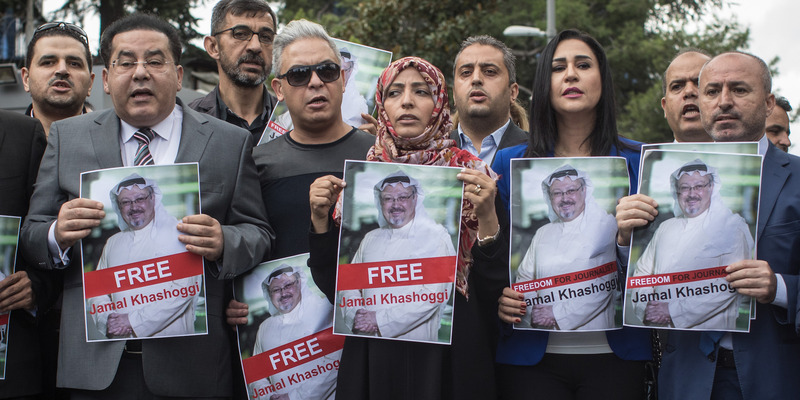 Here’s everything we know about the troubling disappearance of Saudi journalist Jamal Khashoggi. Secretary of State Mike Pompeo arrived in Turkey on Wednesday after visiting Saudi Arabia in response to the disappearance of the Saudi critic Jamal Khashoggi, but repeated, gruesome reports of Khashoggi’s suspected murder have kept the crisis boiling. Pompeo and President Donald Trump appear to be giving Saudi Arabia the benefit of the doubt on Khashoggi, even as every new day seems to bring forth new evidence against the Saudis, longtime allies of the US. Trump has stressed that the investigation into Khashoggi’s October 2 disappearance hasn’t concluded and on Tuesday floated the possibility that another group of people, not the Saudis, had murdered or abducted Khashoggi from the Saudi Consulate in Istanbul. While Pompeo and the Saudis appeared all smiles in pictures from the meetings held to discuss Khashoggi, the trip to Turkey promises a different perspective. Rather than looking to conduct a quiet investigation, Turkish investigators have regularly leaked gruesome details to the Turkish media in reports describing a brutal, sadistic murder in the Saudi Consulate. Turkish President Recep Tayyip Erdogan on Tuesday said the consulate, which Turkish investigators finally were able to search on Monday, two weeks after Khashoggi was last seen,had been freshly painted – implying that evidence could have been covered up. A pro-government Turkish newspaper on Wednesday ran a gut-wrenching account that said audiotapes recorded Khashoggi being tortured, killed, and dismembered. The reports that contradict the Saudis’ story, for the most part citing Turkish officials as sources, not only allege a murder but a murder at the hands of top Saudi officials. Both Salah Al Tabiqi, the head of forensic evidence at the Saudi General Security Department, and Mohammed al-Otaibi, the Saudi consul general, were implicated by Turkish officials speaking with The Wall Street Journal. Implicating high-level Saudi officials may represent an attempt by Turkey to dent the credibility of the “rogue killers” hypothesis first publicly floated by Trump. Chris McGrath/Getty ImagesKhashoggi disappeared after entering the Saudi Consulate in Istanbul on October 2. “Given there seems to be clear evidence that Mr. Khashoggi entered the consulate and has never been seen since, the onus is on the Saudi authorities to reveal what happened to him,” the UN human-rights chief, Michelle Bachelet, said on Tuesday. Bachelet also called for waiving diplomatic immunity for the Saudis and their right to treat their consulate as sovereign soil. Graham, who sits on the Senate Armed Services Committee, has strong sway over whether the US can sell weapons to Saudi Arabia. He joins a raft of bipartisan senators calling for sanctions against the kingdom. Increasingly, business executives and companies have cut ties with Saudi Arabia over the burgeoning public-relations nightmare, while Turkish officials continue to share details of the ongoing investigation. But Saudi Arabia is an absolute monarchy. Only the kingdom’s ultraconservative royal family can make decisions. Without a free press or independent branches of government to check the monarchy, the kingdom can draw whatever conclusion it likes from the investigation. Basically, if the House of Saud did have Khashoggi killed, it would be on them to disclose that and punish themselves. Trump and Pompeo have signalled they plan to put stock in the Saudi investigation, but Turkey has struck a different note. Erdogan has steadily chipped away at the independence of his own country’s investigators, judges, and press through mass imprisonment and purges of anyone deemed an enemy of the president. The media largely dances to his tune. The steady drip of sickening details emerging in the news media indicate that while Trump and Saudi Arabia may have their stories straight, Erdogan seeks to provide evidence that Khashoggi was brutally tortured and murdered, that the killers hid their tracks, and that they were acting on the orders of the royals.